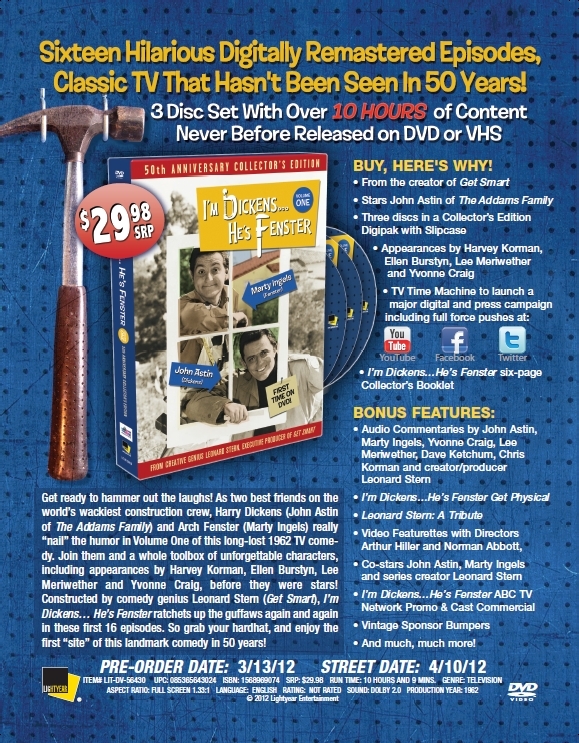 3/14/2012 – Hollywood, CA – Lightyear Entertainment, in association with TV Time Machine Productions, is proud to announce that the brilliant but short-lived 1962 ABC TV situation comedy, I’m Dickens…He’s Fenster, starring John Astin and Marty Ingels, will be released on April 10, 2012, through eOne Distribution. Sixteen hilarious digitally remastered I’m Dickens…He’s Fenster episodes, many of which haven’t been seen in 50 years! I’m Dickens… He’s Fenster followed the comic exploits of two construction workers and bosom buddies (played by John Astin and Marty Ingels). After producing thirty-two side-splittingly hilarious episodes, and despite critics’ raves in The New York Times, The Hollywood Reporter and Time Magazine, the show was prematurely canceled in its first season. By the time its final ratings came in, showing it having beaten Sing Along with Mitch and Route 66 for its time slot, it was too late to reassemble the cast, who had moved on to other projects. The successful and beloved show had become a casualty of timid programming and unlucky timing. Although short-lived, I’m Dickens… He’s Fenster featured an extraordinary roster of guest stars, many of whom made their television debuts on the show including: Yvonne Craig (“Batgirl” from Batman), Harvey Korman (The Carol Burnett Show), Sally Kellerman (M*A*S*H), Peter Lupus (Mission: Impossible), Lee Meriwether (The Time Tunnel), Ellen Burstyn (The Exorcist), Edy Williams (Beyond the Valley of the Dolls), and Jim Nabors (The Andy Griffith Show, Gomer Pyle USMC). The series also featured such directing talent as Arthur Hiller (Love Story, The In-Laws), Jay Sandrich (The Mary Tyler Moore Show, The Golden Girls) , Norman Abbott, (The Munsters), Claudio Guzman (I Dream of Jeannie) and writers Mel Tolkin (Your Show of Shows, All in the Family), Don Hinkley (The Steve Allen Show, The Muppet Show) and Jay Sommers (Green Acres, Ozzie & Harriet). In addition to being creator, writer, director and producer on I’m Dickens…He’s Fenster, Leonard Stern’s remarkable career included writing for the Abbott and Costello and Ma and Pa Kettle movies, and the classic TV shows The Honeymooners, Sergeant Bilko and The Steve Allen Show. From 1965-1970, Mr. Stern was executive producer, writer and director on the classic spy spoof Get Smart (starring Don Adams and Barbara Feldon). He also created, produced and directed the TV series He & She (co-starring Richard Benjamin and Paula Prentiss) and McMillan & Wife (starring Rock Hudson and Susan St. James). He also co-created the immensely popular series of children’s game books, Mad Libs. 2012 is Lightyear Entertainment’s 25th Anniversary year, since its origin in the management buyout of RCA Video Productions in 1987. eOne Distribution is a leader in the distribution of entertainment products through partnerships with the world’s largest physical and digital retailers.